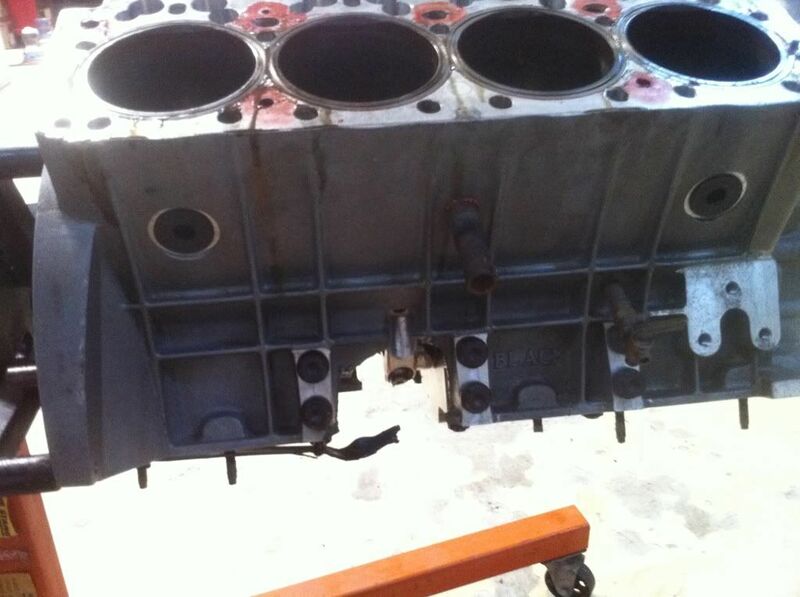 Gasket looked like it was too short on the intake relief and thought maybe overlapped the oring. Was the ceramic still on the plug? or loose? 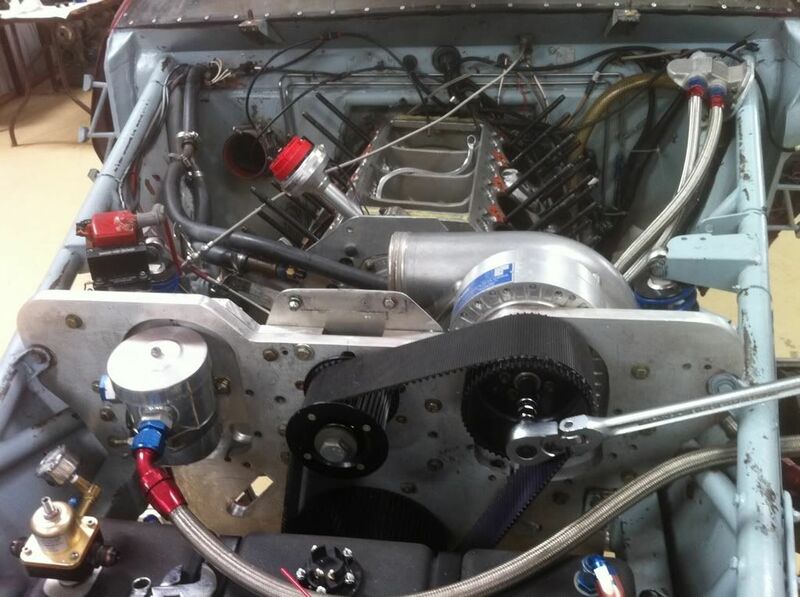 I see what your talking about now ''for those not familiar with the hemi we run, there is a relief in edge of the sleeve and gasket for intake valve clearance'' gasket is within a few thou but not into reciever groove. ........ this brings up a important point. How many of us "dry fit" our engines when installing new parts? 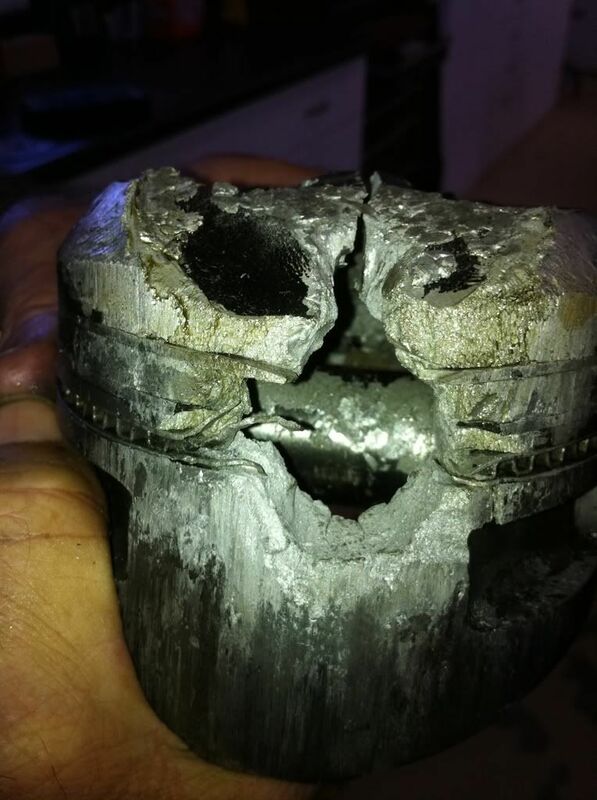 After torqueing heads and bearings, how many of us (including yours truely) fail to roll the motor over or "clay the pistons" which in the end could save a motor or your home equity (in at least my home). I don't personally know John or Troy but I know they are not "newbies" or "wealthy", and I appreciate their honesty and candor in exposing themselves to all the "nay sayers" or "expert's" who think that it easy for a low buck team to succeed in any motor sport. Most of us don't have a pot to p*ss in nor the intelligence or desire to give up our quest. Amen, I have yet to find the currage to hang my junk out in a thread for all to see. JL222 I have learned a lot... Thanks. Yeah..we post the good the bad and the ugly lots of ugly last few years One good, was our blow holes in hood and extra pins at back side of hood on edge of raised part worked great. Before, when shutting off, the ''blow off valves'' which release the supercharged air would lift the back of hood a couple inches. We hope the pins will help keep the hood on in a spin. 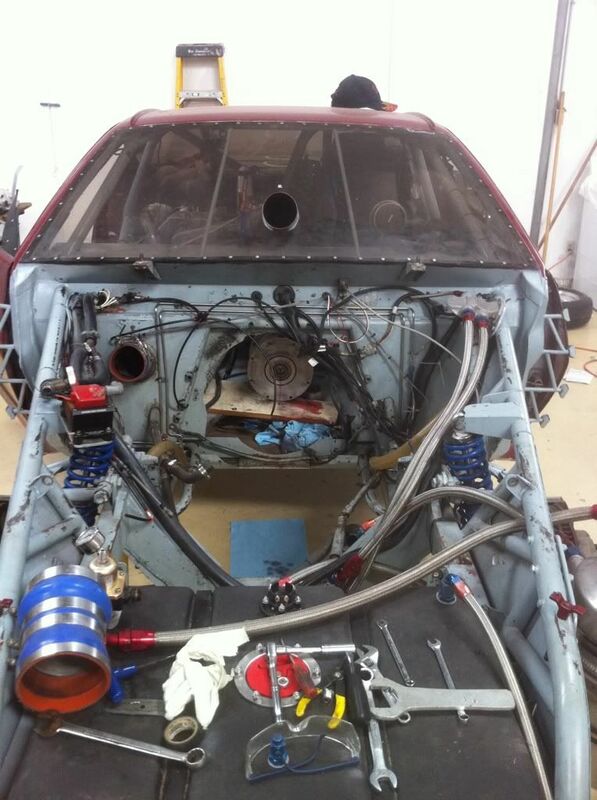 The 280mph 21/4 and 294mph time in the 1st mile keeps us coming back. or out mains on and torqued? Sounds good! You know the deal- Yank the sleeves out that aren't hurt, and leave the caps on. Just give me a call when you're planning on heading down. Last weekend we worked on getting the engine bay cleared out. Here are some pictures of the two holes that need to be fixed. We had to pound the cam out of the block to find out that it is bent. 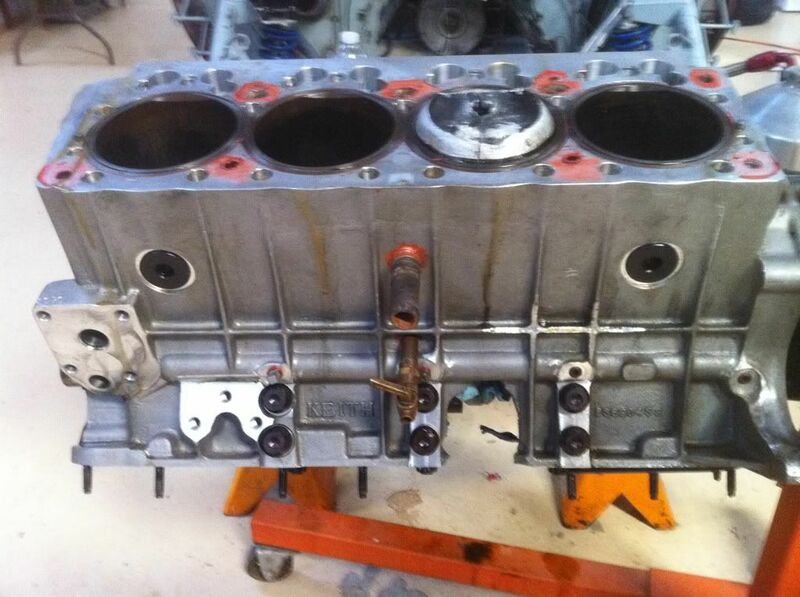 The block needs lots of new aluminum on the interior of the block. We shall see if it is salvageable. Good luck on getting it repaired-looks painful to the wallet! Good luck on the repairs. Maybe saw it in half and make a V4 out of it. 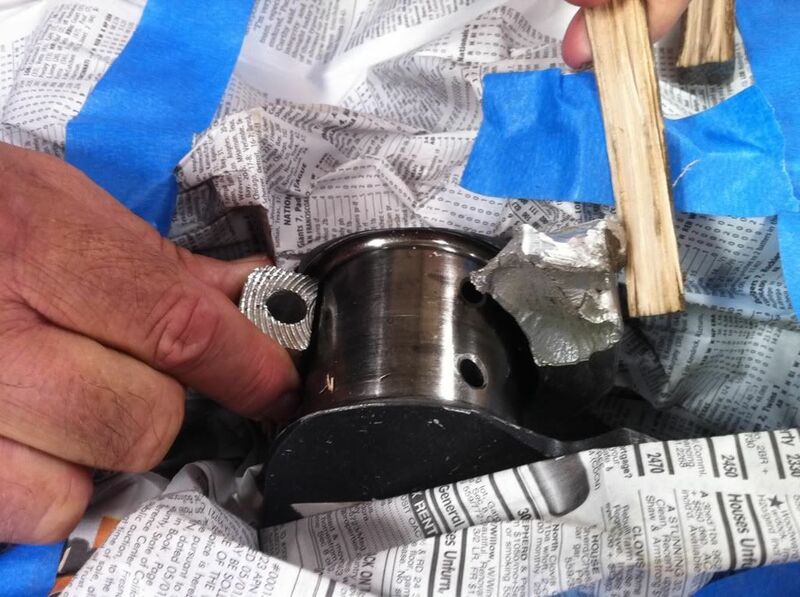 Revising on what caused rod to break after discovering melted side of piston and sprayed aluminum inside of piston. Looked like cylinder got lean [ dirty injector ?] 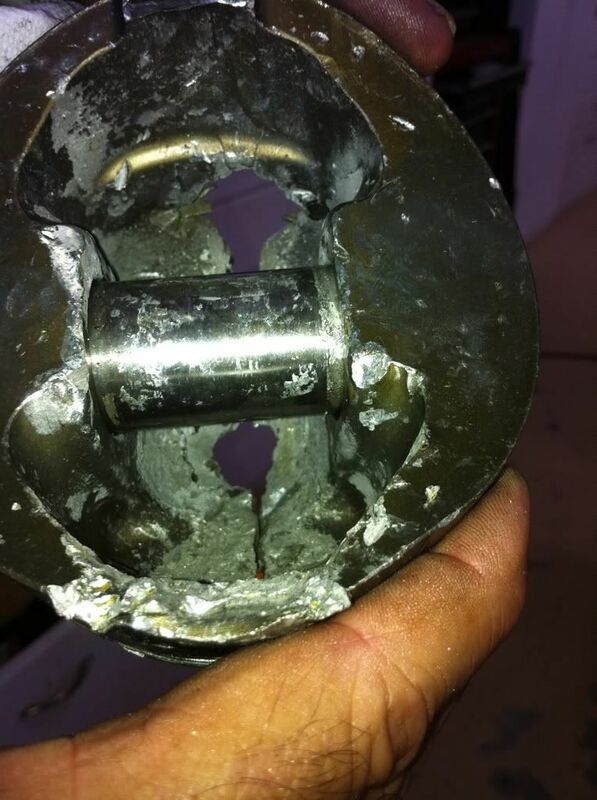 burned hole and started torching the top of rod, pin is even torched Hole started on edge of piston intake valve cut out and we couldn't tell it was torched bacause of valve hammering on other metal on top, but once we hammered it out there is a huge torched hole. Troy will post pics when he gets a chance. Sorry for the delay, a little under the weather. Here are some mangled pieces of aluminum. This is what's left of the cap and rod. 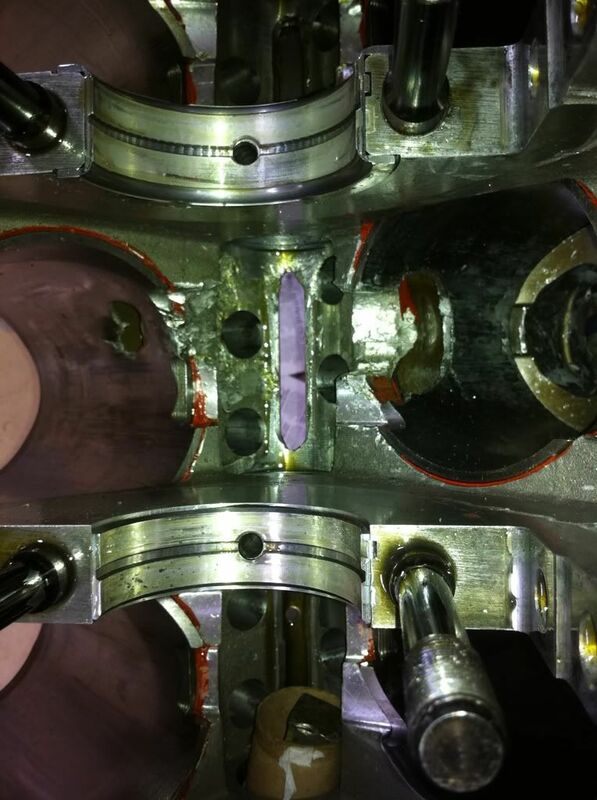 A view of our bearings and the damage to the block at the underside of the cam and the holes in the two sleeves. Are (were) those aluminum rods?